Learning to quit smoking cigarettes through meditation doesn't have to be difficult. 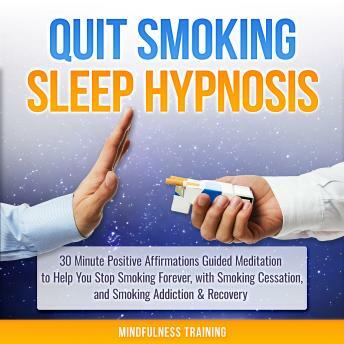 With this 30 minute guided follow up meditation in our popular 'Quit Smoking Hypnosis' series, quitting cravings for nicotine is as easy as pressing play. Throughout this audiobook, you will be guided from start to finish. We will begin with your current state of cigarette addiction and bring you to a relaxed state of calm awareness, where you will be able to push all of your cravings into the distance and find peace within the positive affirmations for quitting smoking. With this wonderful guided meditation, you can fall asleep to it every night and wake up in a positive smoke-free mindset each and every day. There's no need to stay addicted to cigarettes. Grab your copy and start beating the cravings today!